After your child has competed in Beginners for some time, she will also start to learn in class, dances which are not considered Beginners steps. She will then be in a position to compete at the next levels... Primary, Elementary and Intermediate. Your child can still dance in Beginners, however she must dance ‘beginners dances’. If she dances harder steps in the lower grade she will not be marked at all, as this would not be fair to the real beginners. So at some competitions you may be ticking six or seven dances on the entry form. Be aware that this can tire a small child. However, sometimes in the case of children with a dancing background in some other area, she may take to Irish very quickly and start to come First Place in Beginners. If this happens and there are over seven children in the contest, she will be promoted to Primary and no longer be allowed to compete in the Beginner grade in that dance. If you forget and enter your winning child in beginners in that dance at another competition, other mothers will kindly remind you of the win. At the Primary level your child will learn harder dances. Steps she learns in Primary cannot be used in Beginners. Steps such as twists will be included. A recent grade introduced is called Elementary. Elementary has the same steps as Intermediate and Open. These steps must not be danced in lower grades. The idea of Elementary is to bridge the gap between Primary and Intermediate and allows those newly upgraded from Primary a chance to adjust to the harder steps required of them. However the dances are shorter in length (two steps instead of three in Int/Open). If you win in Elementary with eight or more dancers competing you must now dance in Intermediate in that dance. You can stay at this level until you win a section against eight or more dancers and then you will be promoted to Open. The steps are the same for Intermediate and Open and in smaller competitions they often combine these levels. This is the highest level at which a dancer can dance. In this section the competitor dances, say, a reel and a jig and the points are added together. 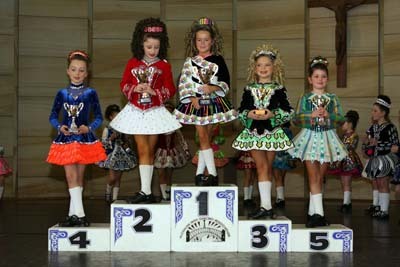 Premierships are danced in age divisions e.g. 8yr old Premiership and sometimes Beginners and Primary Premierships are offered. Trophies are awarded to the best overall dancers. Sometimes there are Reserve Premierships which can only be entered by dancers who have not previously won a major trophy. The scoring of Championships is a little different to those at Beginners Competitions. Once you have been to a few you might like to find out how the scoring is calculated. The State Championships are held over a full weekend in August each year. Another weekend is devoted to the State Teams competition.